Insults his opponent by calling them pagans. 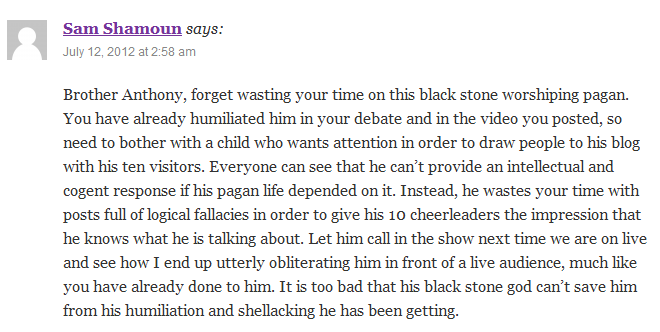 Insults his opponents by calling them stone worshippers. Cheerlead’s his friend’s self contradicting debate statements. Cheerlead’s his friend’s copy pasted video arguments, refuted by the author of the very article the video was stolen from. Insult’s the person himself through the fallacy of character assassination. Employs the constant use of ad hominem throughout his discourse. Now, I have no problem with being insulted, even moreso by Sam Shamoun. In fact, I’d like to thank Sam for demonstrating his true character. This is a man who has to insult a 20 year old (myself – Br. Ijaz) in every comment he posts, he even spent 7 days insulting Br. Qmark, who is another author on this website, also in his 20’s. It’s quite distressing to see that this man can claim to be guided by God and still end up using such filthy, perverted and petulant tactics against people half his age. He’s what we can refer to as an ‘internet thug’. While I am sure that Sam gets thrills off of posting abusive comments, all it does is demonstrate that on an intellectual level he is shallow and on a decorum level, he’s incapable of measuring up to the lowest level of public etiquette. I honestly feel sorry for a man who has to constantly stoop so low as he has to. This is the kind of man who preaches Christ is a God, this is the kind of man that worships another human being. That my friends, is the true definition of being Pagan (creation, human worship). Keep up the good example of prophetic way of doing da’wah. May Allah give your effort barakah here and the hereafter. A quick question what was Muhammad’s dad’s name? His name was ‘Abdullah, whose father was Abdul Muttalib.